Make pictures, charts or other objects align on the page, or with each other, by using “snap to” commands. Click the chart, picture, or object in the worksheet. To position shapes or objects to the closest intersection of the grid, click Format > Align > Snap to Grid. To make a shape or object align with other shapes or objects, click Format > Align > Snap to Shape. Tip: To temporarily override the snap-to options, hold down ALT while you drag the chart, picture, or object. 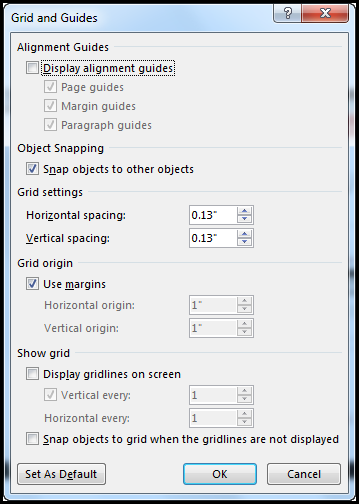 Click Format > Align, and depending on which options, click Snap to Grid or Snap to Shape to disable these options. Click View, and in the Show group, click the dialog box launcher. To position shapes or objects to the closest intersection of the grid, under Snap to, check the Snap objects to grid box. If you want to see the grid on your screen, under Grid settings, check the Display grid on screen box. To temporarily override the snap-to options, hold down ALT while you drag the chart, picture, or object. If you want the current settings in the Grid and Guides dialog box to be the default settings for all presentations, click Set as Default. If the Snap objects to grid box is checked, you can draw in straight lines when you draw a freeform shape . Click View, and in the Show group, click the dialog box launcher . The Grid and Guides box appears. Clear the Snap objects to grid box. Note: If you want the current settings in the Grid and Guides dialog box to be the default settings for all presentations, click Set as Default. Click the chart, picture, or object in the document. Click Format > Align > Grid Settings. The Grid and Guides dialog box appears. 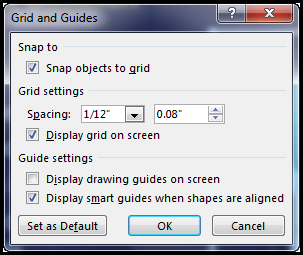 To position charts, pictures, or objects to the closest intersection of the grid even when the grid is not visible, under Show grid, check the Snap objects to grid when the gridlines are not displayed box. To make a shape or object align with other shapes or objects, under Object Snapping, check the Snap objects to other objects box. If you want the current settings in the Grid and Guides dialog box to be the default settings for all documents, click Set As Default. By default, shapes and other objects will snap to the nearest intersection of gridlines only if the grid is visible. Change that by checking the Snap objects to grid when the gridlines are not displayed box. To turn off the Snap objects to grid when the gridlines are not displayed or Snap objects to other objects settings, clear the respective box. Note: If you want the current settings in the Grid and Guides dialog box to be the default settings for all documents, click Set As Default.